Change is coming to Atlanta, and we’re going to be ready for it. Projections suggest that we could triple in population within the next couple of decades. It’s no longer a question of do we want to grow but rather how will we use growth to shape the city we want to become. Over a period of 18 months, we crafted The Atlanta City Design: Aspiring to the Beloved Community to be the city’s guiding design. Its purpose is to articulate an aspiration for the future city that Atlantans can fall in love with, knowing that if people love their city, they will make better decisions about it. These decisions will then be reflected in all the plans, policies, and investments the city makes, allowing Dr. King’s concept of the beloved community to guide growth and transform Atlanta into the best possible version of itself. Our design is rooted in one of the most defining points in our city’s history: Atlanta’s outsized role shaping the Civil Rights Movement. In 1959, Dr. King described the outcome of the Movement as the beloved community. Far from a utopian fantasy, Dr. King saw the beloved community as a realistic and achievable goal – an actual community of people made possible by the Movement. As we prepare for the unprecedented growth ahead, the city must ensure that it also becomes more equitable, more resilient, and more committed than ever to welcoming everyone. The Atlanta City Design is the framework for inclusive growth that Atlanta has been missing. We didn’t create a plan with policy and regulatory recommendations for the next 10 years. We created an ambitious design that will perpetually challenge us to live up to our five core values of equity, progress, ambition, access, and nature in the hard work that lies ahead. Our physical design for the city reflects its physical form: not the sprawling highways that defines us now but our entire evolution beginning with our natural state as a verdant forest in the Appalachian Piedmont. This struggle between preservation of our natural condition and our drive towards urbanization is the basis for our design concept that designs for people, nature, and people in ature. We’re committed to the Atlanta City Design and building the beloved community. In December 2017, we amended our charter to recognize the Atlanta City Design as the design of the city. It is already strategically realigning the city’s myriad plans, projects, policies, and priorities. These are the critical next steps of developing and detailing our design and include the city’s urban ecology framework, new mobility plan, zoning ordinance re-write, historic preservation strategy, and housing strategy. The Atlanta City Design is drawing these plans together with clarity and common purpose in way that has not happened before in the city’s history. It has also inspired a collaboration with the public school system to create an eighth-grade school curriculum in the Atlanta Public School System that is now being taught to over 2,000 students. The Atlanta City Design is NOT a plan. Planning does a lot of very specific things. It manages the process of planning the city, including the development and enforcement of policies related to land use, transportation, and zoning. It reviews and permits the construction of buildings and other projects. It assists people on all kinds of technical issues and initiatives related to housing, urban design, and preservation. Most often, it’s deep in the weeds, sorting through a lot of details. The Atlanta City Design is our opportunity to step out of the weeds and consider the city as a whole – to dream about a future Atlanta that we want, and then design our approach to achieve it. This work is fun, but it is also essential, because when we look at the tremendous growth and change that is coming, we see that not changing is not really an option. This is why we created the Atlanta City Design. Our intention is to reveal the city’s physical identity as a basis for the design of our future, and then propose ways to improve and accentuate Atlanta’s authentic character in a form that can accommodate a much larger population. Envisioning what that looks like – how Atlanta can become a better place to live and do business while doubling, or even tripling, our population is essential. Not since Daniel Burnham’s Plan of Chicago in 1909, has a city truly undertaken a long-term design vision fueled by fast-paced growth. Burnham designed the relationship between people and the public realm, proposed a physical form to bring form to formlessness, and led to the development of a public school curriculum to ensure engagement and endurance. 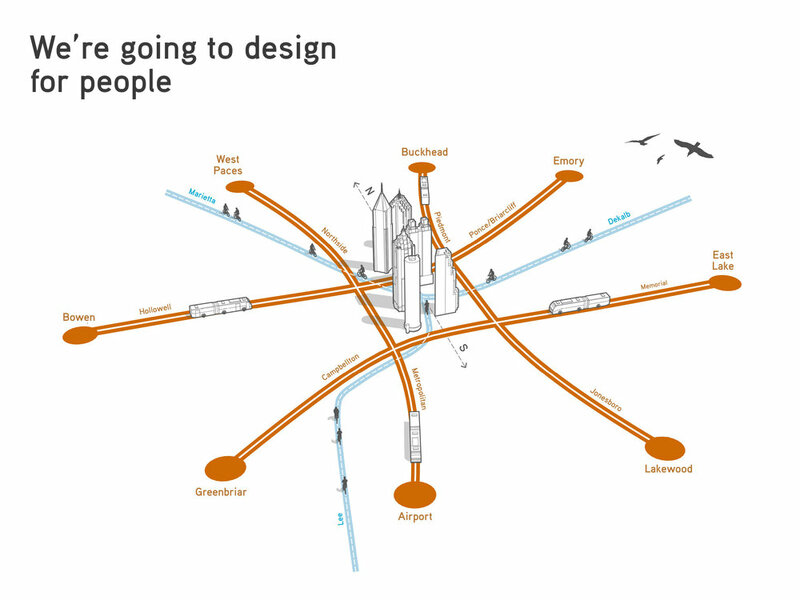 Like the Atlanta City Design, the Plan of Chicago is aspirational. Over 100 years later, it continues to shape Chicago’s physical form. The Atlanta City Design: Aspiring to the Beloved Community is the first step in a design process. Think of it as our concept design for the city. It describes who we are and how, based on that identity, we can leverage the change we see coming to create a dimensional, tangible, and aspirational form that will enable us to become a better version of ourselves. Following through on this aspiration is the next phase: the design development. This phase involves drawings the city’s myriad plans, projects, policies, and plans together with clarity and common purpose in service to the concept. Finally, over the next generation, we will operationalize the design’s actions and ideas through the actual construction of projects that shape the city. This will require the work of the Department of City Planning, the mayor and city council, other divisions of city hall, and many external partners, including everyday citizens. The Atlanta City Design is capturing the city’s imagination, mobilizing its residents to action, and instilling a sense of accountability to its future. We are building the beloved community. When built, this design will enable a new generation of growth to create an even better Atlanta for everyone.